This last August weekend is jam-packed with activities—make it count! Canada’s largest fair continues! The Canadian National Exhibition has something for everyone, including rides and games, a working farm, daily parades, celebrity chef demonstrations, live concerts and entertainment, and so much more. See you at The Ex! Exploring the concept of the “crossover,” this year’s Telus TaiwanFest offers a number of cultural events—both traditional and contemporary—related to the intermingling of Taiwanese, Canadian, Dutch, Japanese and indigenous cultures. Harbourfront Centre is home to this weekend-long festival, featuring dance, theater, fashion, food and live music. Tonight, witness a performance by the Rom Shing Hakka Opera Troupe. Scotiabank Buskerfest takes over the streets of the St. Lawrence Market neighbourhood beginning tonight! Some of the world’s most talented street performers, including members of the renowned Cirque Éloize, are on hand to show off their unique skills. A donation to the Epilepsy Toronto charitable organization is encouraged. Saturday: Laugh with Graham Harley and the cast of What the Butler Saw (photo by Sian Richards). Attention all comic book enthusiasts, sci-fi aficionados and anime experts: Fan Expo Canada has arrived. The largest event of its kind in the country features top names in geekdom, plus vendors, panel discussions and more. Don’t miss the Masquerade on Saturday morning, when die-hard fans show off original costumes of their favourite characters! Enjoy a theatrical night out with a performance of What the Butler Saw, an inappropriately hilarious play on now at the Young Centre for the Performing Arts. The witty farce is set in a psychiatrist’s office and is certain to keep the audience guessing which characters are the sane ones. Cheer on “The Reds” this evening, as Toronto FC squares off against Real Salt Lake, one of Major League Soccer’s top teams. Can Dwayne DeRosario and company sneak into the playoffs with a win tonight? Head to BMO Field to find out! Against all odds, ’90s grunge stalwarts Stone Temple Pilots are back with their first original album in a decade. The Scott Weiland-led rockers are set to riff on their newest tunes and popular classics at the Air Canada Centre. Yonge and Dundas Square turns green this weekend. The Live Green Toronto Festival brings together more than 100 exhibitors featuring eco-friendly products and services, as well as live music, street performers, a farmer’s market and more. The Sunnyside Beach Juried Art Show & Sale returns for another year of fine visuals. 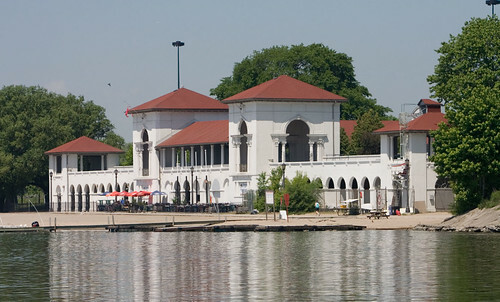 Hosted within the historic Sunnyside Pavillion on the shores of Lake Ontario, the event features artworks in various media created by emerging artists. Cast your vote for the People’s Choice Award to give your favourite artist the chance to win a cash prize. Friday: See pyrotechnic performers at Buskerfest. Try making Chia-A-Noodle, a dish going back to the days of a mostly poor, agricultural Taiwanese society, at Taiwanfest. While slurping up your fresh-made noodles, take in art exhibitions, fashion, music, demonstrations and films at two festival venues: Harbourfront Centre and the Distillery Historic District. Ooh and ahh as Dream State Circus, The Fast Horses, Trulee Odd, PyRomeo and Circus Orange light it up in a nighttime fire show, the “hottest” gala performance at the 10th annual BuskerFest in Old Town Toronto. Lose yourself in your thoughts while walking the Toronto Public Labyrinth in Trinity Square (between Queen and Dundas streets, entrance off Bay Street), an oasis of peace in the heart of the bustling city. Saturday: The historic Sunnyside Pavilion hosts an art show. Taste specialties of African cuisine at the Toronto African Film & Music Festival marketplace on Bloor Street, between Ossington and Christie Streets. Get ready for dark humour as Soulpepper Theatre Company opens Who’s Afraid of Virgina Woolf? Edward Albee’s 1962 boundary-crossing masterpiece provides an honest glimpse into married life at the time. View paintings, photography, sculptures and fashion (and meet the artists!) showcased in the annual Sunnyside Beach Juried Art Show & Sale at the historic Sunnyside Pavillion. Sunday: Hear music at Mount Pleasant Cemetery. Make yourself comfortable amongst the graves and gardens at Mount Pleasant Cemetery for its Music at Mount Pleasant series. Today, a Royal Conservatory of Music brass quintet performs Bach and other classical works. Take a walking tour of the city’s most eco-friendly sites and spaces as part of the Live Green Toronto Festival. Be sure to return to the festival hub at at Yonge-Dundas Square to check out over 100 green exhibitors and hear live music by The Philosopher Kings, Samba Squad, Carly Rae Jepsen and more. Blow bubbles in the streets at today’s air-themed Pedestrian Sunday in Kensington Market. With cars banned for the day, it’s easy to experience the multicultural neighbourhood’s many charms.